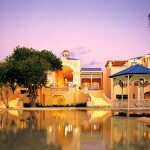 Royal Hideaway Playacar is a luxury all-inclusive resort on Mexico’s Riviera Maya. It is also the first resort of its kind to receive the AAA Five-Diamond Award, and it’s easy to see why when you step onto the property. Upon arrival, champagne & relaxation begin to flow. We were greeted with a cool fresh scented hand towel and a bubbling glass of champagne. There is no registration desk. We simply were invited to sit on a couch, relax, and enjoy our champagne, while the staff checked us in. As I looked around the lobby I was reminded again why this is one of my favorite hotels. It’s full of classic ambiance, gorgeous flower arrangements, chandeliers, marble floors, and beautiful oil paintings, this not like any other hotel in Mexico. 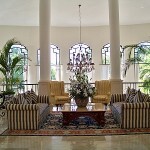 The rooms were laid out in two-story colonial Mexican-style villas, each with a private concierge (who can assist with other services, such as dinner reservations, tours, cultural excursions, deep-sea fishing, golf, private tennis lessons, motorized water sports, spa and salon services, car rentals, laundry and dry cleaning and more.) All rooms had a complimentary beer and soda minibar, Bvlgari toiletries, double marble sinks, a separate shower stall, whirlpool tub, Bose sound systems with iPod docks, LCD flat screen TV and large walk in closets with bathrobes. There was plenty to do, or do nothing at all at this resort; With a fitness center, basketball, bocce ball, horseshoes, tennis, SCUBA lessons, sailing and cooking classes, kayaking, boogie boarding, windsurfing and aqua aerobics in the cascading infinity pool which overlooked the beach. The beach never felt crowded and we never had a problem securing a beach bed. Waiters catered to us like we were royalty by the pool and on the beach. The service here was spectacular. At lunch time we would dine at The Deck, a casual bar and grill located right on the ocean. The menu had a huge variety of meals but our favorite always seem to be the chicken tenders with chipotle mayonnaise. At night there were 6 gourmet restaurants to choose from. 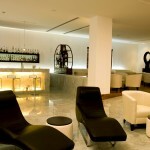 All require reservations, are a la carte and have a dress code of casual elegance. The concierge will help you with the reservation and it’s my advice to make reservations for your entire stay shortly after arrival. For the foodies the Chef’s Table experience is accompanied by fine wine pairings and takes place in a private dining room with very limited seating. While this wonderful culinary experience is not included ($150 per person), it is truly worth it for those who love food and wine. They also offer 24 hour room service, which we were very thankful for after a night out at Coco Bongo Disco just a short cab ride away. Royal Hideaway’s attention to detail and emphasis on customer service was apparent throughout our stay. If you’re looking for an all-inclusive property that truly delivers on luxury, Royal Hideaway is the ideal choice for you. Feel free to contact me with any question you may have.